Vado draws on the rich and diverse dance tradition from the Ivory Coast. With over 60 different ethnic traditions, the variety of steps and rhythms taught is complex, exciting, and vigorous. Class is taught first with a simple warm-up, followed by learning steps to a particular dance. Drumming begins, and the dance is performed as a whole. 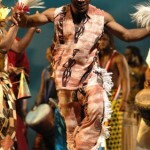 Then travelling steps are practiced across the floor with the drums to several other dance rhythms culminating in a final run-through of the learned dance in front of the drums.